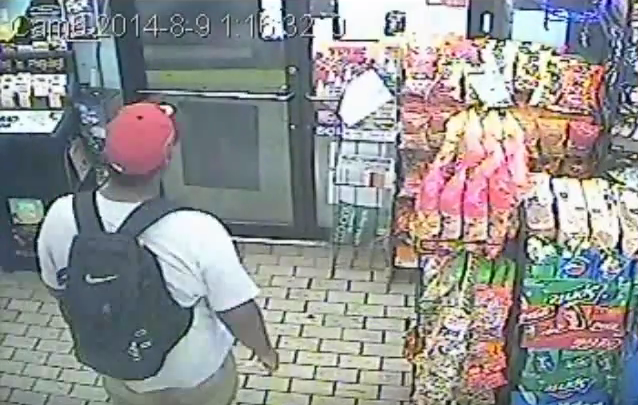 Michael Brown is seen in Ferguson Market security footage at 1:16 a.m. on August 9, 2014. The video, which was not the same one that Ferguson authorities showed days after Brown's death in August 2014 alleging he was a suspect in a robbery, is part of a documentary called "Stranger Fruit." The filmmaker, Jason Pollock, said this weekend that the new security video shows Brown trading marijuana for cigarillos. St. Louis County Prosecutor Bob McCulloch, who oversaw the grand jury investigation into Brown's death, said in a news conference Monday that authorities knew about the earlier video but did not release it because it was "not relevant or material or admissible in anything that we were investigating during that time frame." The St. Louis County Prosecutor's Office also released five security videos today from the early hours of August 9, 2014, including the footage used in Pollock's documentary. Watch the newly released footage here. Former Ferguson officer Darren Wilson was cleared by the grand jury of wrongdoing. McCulloch said the earlier video, dated Aug. 9, 2014, was in the original police report. "It's not as if this was hidden away somewhere," said McCulloch, who also released the full video and was critical of the documentary filmmaker. A lawyer for Ferguson Market, the convenience store in question, said Pollock's assertion is incorrect, that no drug transaction took place and that he was open to speaking with anyone and walking them through the video and his clients' position. "My clients had nothing to do with Michael Brown's death on Canfield [Drive]," attorney Jay Kanzler said. "They just didn't, and to suggest otherwise recklessly like this documentary does, is scary." Ferguson Mayor James Knowles referred requests for comment to Ferguson's police chief, Delrish Moss. Moss said he hadn't seen the video, but is concerned that the publicity will cause protests and tensions to flare up again. Already, a few dozen people protested outside of Ferguson Market, 9101 W. Florissant Ave., where the surveillance video is from, on Sunday night, the Post-Dispatch reported. Officials charged a 44-year-old man with attempting to start a fire in a St. Louis County police vehicle by stuffing a napkin in the gas tank and trying to ignite it. Moss said one of his police officers suffered a broken nose Sunday. Moss added that "a lot has changed since 2014," pointing to Ferguson’s City Council, staff and police department. “And although these videos seem to be new with regard to the public, they’ve had a lot of scrutiny. So what I tell people is if you’re going to come to Ferguson, come to Ferguson to do something positive." McCulloch’s office has faced scrutiny and criticism for the way it handled the grand jury investigation. His decision not to call for a special prosecutor to handle the case drew the ire of activists because they believed McCulloch couldn't be impartial because his father, Paul McCulloch, a St. Louis police officer, was shot and killed, in the line of duty, by a black man in 1964. He was also criticized for overloading the grand jury with weeks’ worth of evidence, rather than presenting what was needed to prove probable cause. An ethics complaint filed in 2015 accused McCulloch and the assistant prosecutors who appeared in front of the grand jury of acting more like defense attorneys for Wilson than a prosecutor. Willis Ryder Arnold and Rachel Lippmann contributed to this report.